Added on 16 November 2018 . By Anisah Audu. This alternative menu is about to jingle your bells. Move over turkey, because 2018 is the year of quirky Christmas menus and we're all for it. Been bad this year? Forget about a lump of coal because Poppies have chips sprinkled with charcoal. For those that have been good, it's glitter for you... You go Glen Coco. 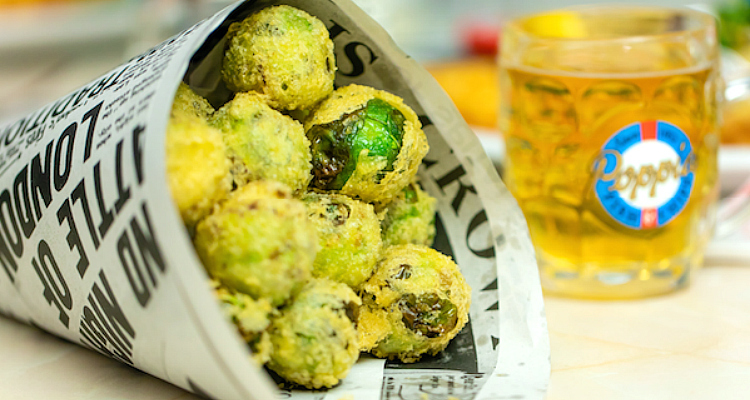 Alongside the naughty & nice chips, the Old Compton Street fish and chip shop is even bringing battered Brussels sprouts to the table. If you're over mulled wine and eggnog, try something a little nostalgic as Poppies throws it all the way back with a slinky little Snowball number. A festive classic, it combines advocaat with lemonade and lime juice for a creamy and balanced finish. For a Christmas feast that sleighs, head to Poppies Soho at 55-59 Old Compton Street, W1D 6HW. The festive menu is available from 1st – 24th December.